As Avingard watched the Thalmor walking ahead of him along the road, he soon spotted something off in the distance. It looked like a cart stranded in the middle of the road. After moving closer to the cart he also noticed a large man lying near the cart. Unsure of what had happened, Avingard continued to move closer, while keeping his distance from the Thalmor. Suddenly, an Orc bandit and a Redguard bandit bolted towards to three Thalmor travelers. Within a few seconds both bandits were cut down and their bodies falling lifeless down a slope until they were stopped by some bushes. A sword and shield marked where they were killed by the Thalmor. 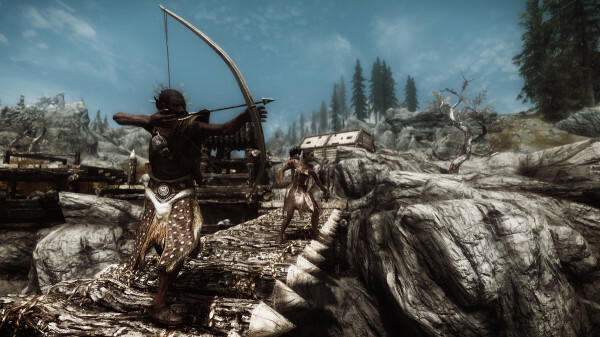 Once the two bandits were dead, the Thalmor had turned their attention to a third bandit, an archer, who was off to the left of the road in some buses. Two of the Thalmor, attacked with melee weapons, one with a sword while the other used a hammer. The third Thalmor, a mage, used magic to attack the archer. The archer attempted to meet the two melee combatants with a dagger, but was soon killed by the Thalmor. While the Thalmor attacked the three bandits, Avingard heard a twang of a bow behind him. Just before he could turn around, an arrow flew through the air and struck his sword which was still being carried on his back. The force knocked Avingard forward. He didn’t have time to search for the archer, so he quickly scrambled behind the card and readied his sword. A second arrow was released, and struck the cart, wedging itself in the planks. Avingard soon spotted the archer, but before he could move forward to attack, the three Thalmor also noticed the archer and advanced as well. “Don’t you see? Elven supremacy is the only truth!” one of the Thalmor yelled to the archer. Soon all three Thalmor and Avingard were battling the lone archer. The Thalmor mage unleashed magic that brought the archer to his knees, and then Avingard unleashed the final blow, killing the archer. Once the bandits were killed, the Thalmor continued on their way. Avingard searched the bandits for valuables before also continuing down the road, once again keeping his distance from the Thalmor. A few short minutes later, the Thalmor were once again in combat. A bit further along the road from the last bandit ambush, a more formidable fortress guarded the road. The fortress consisted of some archer towers, a walk way over the road and a camp setup behind a wall constructed of timber. Within the towers and on the walkway were bandit archers, who wasted no time in letting loose arrows at the Thalmor. Avingard, staying well back of the Thalmor, was not yet in range of the archers. Bandit Archers Attacking at Robber’s Gorge. While avoiding the arrows, the three Thalmor sprinted forward towards the bandit fortress. Avingard realizing that getting involved with pointless, tried to stay out of the battle. Unfortunately, he needed to get through the fortress to get to Solitude, so he continued his trek forward. As he came within range of the archers, he soon found himself under attack, but not wanting to do battle, he began to run and dodge the arrows. 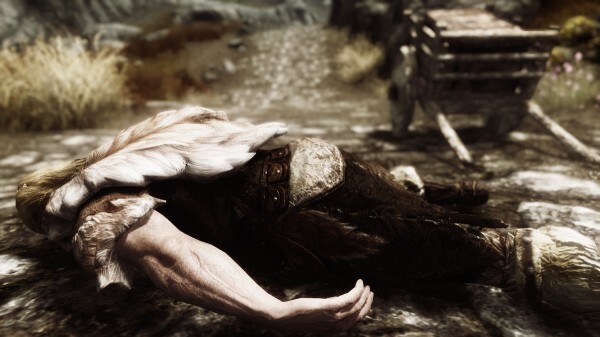 Just as the Thalmor passed under the walkway, large boulders were released onto the road, just missing the three Thalmor, who by this time were now in the camp in battle with other bandits. Avingard continued to sprint pass the fortress, and was soon out of range of the archers. Avingard paused for a moment to turn around and view the battle. He noticed that a few of the bandits had been killed, but the battle was still waging. Even though there were only three Thalmor, and at least twice as many bandits, Avingard realized that the battle would eventually see the Thalmor the victors. After catching his breath, Avingard turned and continued down the road towards Solitude, this time without the Thalmor in the lead. The journey started out without any incident for the next little while until Avingard came across a most unusual sight. Off to the left of the road lay a dead horse, and a cart. As Avingard approached he also noticed a Redguard woman lying near the cart on the road. but there are rumors of worse. Unsure of what had killed the woman, or what happened to her husband, Avingard decided to bury the woman nearby. After about an hour, he had completed the task, and then marked the location of where he buried her. This has been a very dangerous journey, and the Redguard woman knew all too well that could happen on the road from Solitude to Whiterun. Thinking about the death of the Redguard woman put his journey into perspective, but he knew he had to carry on to Solitude. Leaving the cart and horse behind, Avingard once again started his trek to Solitude.